That wasn’t the worst earworm of all. That honor belongs to Lilo and Stitch. Thanks to Disney Junior, a lot of older Disney Shows are getting re-aired. One of these that my boys have taken a liking to is Lilo and Stitch The Series. Where the original movie saw Lilo meeting Experiment 626, aka Stitch, this television series had Lilo and Stitch trying to catch the rest of the 625 experiments that Jumba created. NHL, however, has gone a bit further than merely "liking" the series. He’s memorized the theme song. While in the car one day, he began to sing it – complete with Stitch’s "alien language" lines. Yes, even those words have been imprinted on his brain to be recalled at will. Unfortunately, the constant playing of the episodes and singing of the theme has left it imprinted on my brain too. I’ll be in the middle of work and realize that the song is playing in my head and won’t stop. Since the best way to stop an earworm is to share it, here’s the theme song. What’s that? You don’t stop an earworm by sharing it? Oops. Well, time for me to go. Aloha! 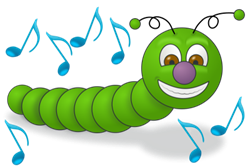 Disclaimer: The image above is a combination of "Music Icon" by Minduka and "Green Worm" by Carlitos. Both came from OpenClipArt.org.